A cultivar of Camellia japonica L. An English bred camellia, similar to ‘Althaeflora’, with dark orange-red, double flowers with irregular petals, deeply notched at the apex. [ICR, FC p.154/1836]. Listed in the 1845, 1850 and 1857 catalogues [T.264/1845]. ‘Vandesia superba’ was probably obtained from Loddiges’ Nursery, either in a case of plants brought back by Bidwill or in a direct importation in late 1844. 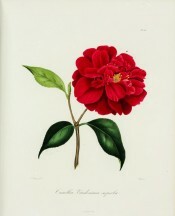 Concerning the latter Macarthur wrote on 6th January 1845 that he now had five camellia ‘which we had not before’, and of the former that he had saved 60% of the plants: ‘You will judge therefore how much I am in your debt’. [MP A2933-2, p.28].